Legionnaires' disease (LEE-juh-nares) is caused by a type of bacteria called Legionella. The bacteria got its name in 1976, when many people who went to a Philadelphia convention of the American Legion suffered from an outbreak of this disease, a type of pneumonia (lung infection). Although this type of bacteria was around before1976, more illness from Legionnaires' disease is being detected now. This is because we are now looking for this disease whenever a patient has pneumonia. Each year, between 8,000 and 18,000 people are hospitalized with Legionnaires' disease in the U.S. However, many infections are not diagnosed or reported, so this number may be higher. More illness is usually found in the summer and early fall, but it can happen any time of year. Legionnaires' disease can have symptoms like many other forms of pneumonia, so it can be hard to diagnose at first. Signs of the disease can include: a high fever, chills, and a cough. Some people may also suffer from muscle aches and headaches. Chest X-rays are needed to find the pneumonia caused by the bacteria, and other tests can be done on sputum (phlegm), as well as blood or urine to find evidence of the bacteria in the body. These symptoms usually begin 2 to 14 days after being exposed to the bacteria. A milder infection caused by the same type of Legionella bacteria is called Pontiac Fever . The symptoms of Pontiac Fever usually last for 2 to 5 days and may also include fever, headaches, and muscle aches; however, there is no pneumonia. Symptoms go away on their own without treatment and without causing further problems. 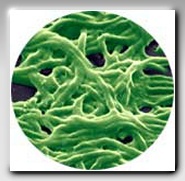 Legionnaires' disease can be very serious and can cause death in up to 5% to 30% of cases. Most cases can be treated successfully with antibiotics [drugs that kill bacteria in the body], and healthy people usually recover from infection. People get Legionnaires' disease when they breathe in a mist or vapor (small droplets of water in the air) that has been contaminated with the bacteria. One example might be from breathing in the steam from a whirlpool spa that has not been properly cleaned and disinfected. The bacteria are NOT spread from one person to another person. Outbreaks are when two or more people become ill in the same place at about the same time, such as patients in hospitals. Hospital buildings have complex water systems, and many people in hospitals already have illnesses that increase their risk for Legionella infection. Other outbreaks have been linked to aerosol sources in the community, or with cruise ships and hotels, with the most likely sources being whirlpool spas, cooling towers (air-conditioning units from large buildings), and water used for drinking and bathing. CERL can provide the specialized assessment, sampling and sample shipment required for diagnosing the presence of Leginella bacteria in a facility.